Model Name: Compax "Exotic Nina"
Accessories: Accompanied by the original presentation box, an additional dark blue service bezel and Universal Genève Extract from the Archives confirming production of the present watch in 1971. In the late 1960s, Nina Rindt, the wife of the famous Formula One driver, Jochen Rindt, became a Universal Genève icon after she was photographed on the race track wearing a “Panda” black and white Compax on a Bund style strap. Embodying the elegance and cool cat attitude, her name was consequently used to nickname the white and black reverse example: “Evil Nina” and the more original blue or silver version the “Exotic Nina”. In November 2018, we had the privilege to auction a blue “Exotic Nina” and we are equally pleased now to present its silver sibling. A subtle mix of brushed silver and matt grey central portion, blue subdials and outer track, red five minute markers, and chronograph hand give the watch a most surprising and arresting visual appeal. This silver version is completed with an “Air Force blue” color bezel identified as being the color of the sky on a clear day. Thanks to researches with the Universal Genève archives department, we are able to confirm that this specific bezel color was specially made and only fitted on the two “Exotic Nina” references 885.107 and 885.108. The watch is nevertheless accompanied by an additional dark blue service bezel. In absolutely superb condition with a strong case, crisp engraved numbers on the caseback and immaculate dial, this watch presents a rare opportunity to purchase a beautiful watch that is fast becoming an iconic vintage chronograph. Universal Genève was founded in Le Locle, Switzerland in 1894 and was originally known as "Universal Watch." Since its inception, Universal Genève has produced watches with unusually high quality for their price point. 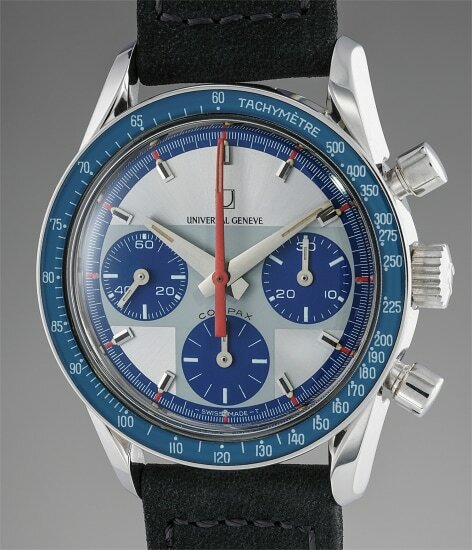 Universal was among the first brands to introduce a chronograph wristwatch. Today, the firm's vintage models are highly sought-after and desired for their oversized cases and interesting dial designs. Key models include a variety of "Compax" models such as the "Nina Rindt" or "Evil Nina," the Uni-Compax, the Space-Compax, the Aero-Compax and the Film-Compax.